Dublin International Airport , also called Aerfort Bhaile Átha Cliath, is Ireland's largest and most important airport. The airport is the main hub of the Irish airlines Aer Lingus, Aer Arann and Ryanair. It is one of the 20 largest airports in Europe and handles 23 million passengers a year. A large number of scheduled and charter airlines operate flights from Dublin airport inlcuding some well known low-cost carriers such as Flybe and Ryanair which operate cheap flights to airports in Spain such as Malaga, Alicante or Tenerife. 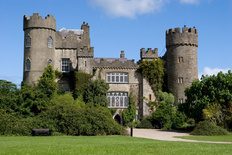 One of the most popular routes is from Dublin to London, and the cheapest flights to Dublin from London are operated by Aer Lingus and Ryanair, for example. Use the M50/M1, then take the exit signposted to the airport. Yes; paid short and long stay parking. About 18 000 parking spaces in various car parks.